For those of you who thought that maybe Henry Cavill was standing in the lunch room of Fawcett Central, we’re sorry to let you down. But for those of you more interested in Handley’s previous credits, he’s also the stunt double for Zachary Levi’s Shazam in the David F. Sandberg-directed film. Ryan Handley has also served as a super heroic stunt man in films such as Suicide Squad, as well as both Deadpool movies. He can now add Superman to his list of superheroes played on screen. 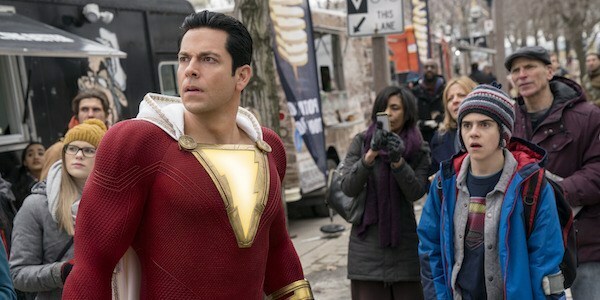 As previously reported, Handley wouldn’t have had to fill in if the original plan for Shazam’s ending cameo were fulfilled. Henry Cavill was asked to fill the costume again, but because of scheduling issues, the Man of Steel star wasn’t able to oblige. Then, of course, there was the big announcement that Cavill is pretty much done with the character, although officially that still hasn’t been confirmed. In any case, though this was kind of a sad happening, in a sense, producer Peter Safran thought the creative solution without Cavill’s participation actually helped the film’s ending work even better. Which leads to Ryan Handley’s official confirmation of playing Superman in Shazam!, a fact that German film site Filmstarts confirmed directly from the studio itself. It certainly helps that Handley was already in superhero shape to bring Shazam to living, breathing life; so using him to play one of the Daily Planet’s finest was a convenient fix to a big problem. Though it might be a good thing that Henry Cavill wasn’t on the set, because if he and Zachary Levi were to physically have an actual conversation about whether Batman or Superman was the better hero, we know exactly where both of them would land. Though, to be fair, it’d probably resulted in a scenario where both of their stunt doubles did their fighting for them, and since Ryan Handley played them both in Shazam!, it’d be a very interesting hypothetical fight. Shazam! is currently in theaters, but if you’ve already seen it once, maybe even twice, you might be in the market for something new in theaters. In which case, feel free to visit out 2019 release schedule, as we’ve got everything you could need on the calendar for the year.